It is with a heavy heart that we announce that the court case regarding the German Shepherds has concluded with a hung jury. The judge in the case has ordered that 13 of the 36 dogs be returned to their owner and the remaining 23 dogs continue to be held in protective custody pending the retrial of the case. We want to thank everyone who has been unwavering in their support of the dogs, volunteers and staff throughout this 16 month ordeal. We will be posting another update as soon as we know more. As animal lovers, we want to believe that everyone treats animals kindly. When we are faced with the reality that that’s not the case, we are shocked and saddened. Animals are abused or neglected in many ways and it makes us angry to know that an animal has been made to suffer at the hands of a human. We see abuse and neglect disturbingly often. Last year alone, our cruelty investigator received over 800 complaints of cruelty or neglect. 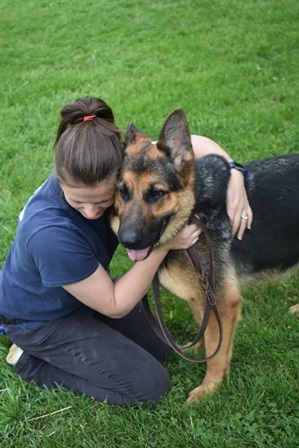 Our most infamous case this year has been the 36 German Shepherds rescued from severe neglect. It began on Dec. 13, 2017, nearly a year ago, when the first 9 Shepherds were rescued after a negligent fire in Bristol, NH killed 29 other dogs. The remaining 9 were trapped in the burned out basement. Just 20 days later, another 22 Shepherds were rescued from the same owner who was holding the dogs in the loft of a barn. It was -11 degrees inside the barn when we took the dogs from their wire crates, shaking and hungry. The only water or food to be found was frozen solid. Then in February, one of the dogs added 5 newborn puppies to the collection, bringing the total to 36 German Shepherds in our care. The owner of the dogs has since been charged and convicted of animal cruelty, but continues to appeal, leaving the animals in our protective custody. The appeals and postponements have left us holding the 36 Shepherds in limbo for nearly a year. 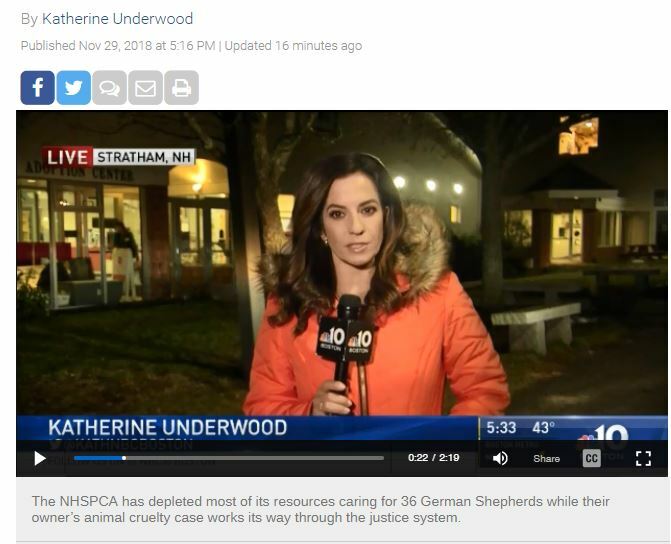 Stratham, NH – On Thursday, July 19, 2018, the case involving the 36 German Shepherds held since December finally went to court. The defendant was found guilty of multiple charges of cruelty to animals. However, the dogs remain in protective custody limbo for what likely will be several more months. Ms. Choate was found guilty on 22 charges of animal cruelty. She was ordered to receive 1 year in jail with 6 months suspended. In addition, she would have to relinquish the animals, pay restitution to the NHSPCA and only be able to own one dog at a time for the rest of her life. Her appeal has put all of these court orders on hold. The New Hampshire SPCA is required by law to keep the animals, held as evidence, until the court decides their fate. In addition, the burden of the cost of caring for 36 dogs continues to grow. While Ms. Choate has been ordered to pay restitution, the Appeals Court has the power to reverse this decision. And even when restitution is ordered, historically the collection rate is minimal. If you would like to help with the cost of care and to help ensure recovery of the Shepherds and other victims of cruelty or neglect, please make a tax-deductible contribution to the SOS FUND by going to www.nhspca.org. A direct link to the SOS Fund here. Gifts to the SOS Fund can also be made by phone at 603-772-2921 x 102 or by mail: New Hampshire SPCA, PO Box 196, Stratham, NH 03885. 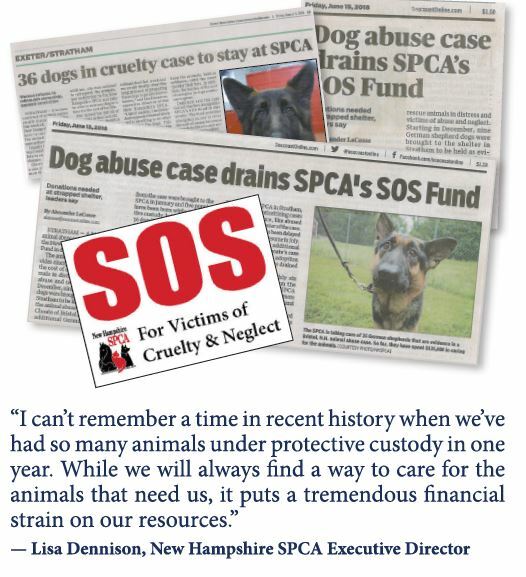 Your gift to the SOS fund will specifically help ease the tremendous burden of expenses associated with cruelty cases. Your donation will help pay for expensive medicine, veterinary care, medical supplies and many other costs that accompany animal rescues.